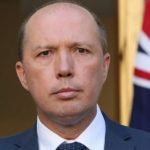 The fact that home affairs minister Peter Dutton was voted number one on a list of Coalition MPs the public would like to see ousted in the next federal election would be no surprise to much of the community. But, the overwhelming majority of the vote that he garnered, may raise a few eyebrows. Lobby group GetUp launched a new appeal a fortnight ago, asking supporters to vote their top three choices from a hitlist of eighteen hard right Coalition MPs that they’d like to see the campaign group target in the lead up to the next election. 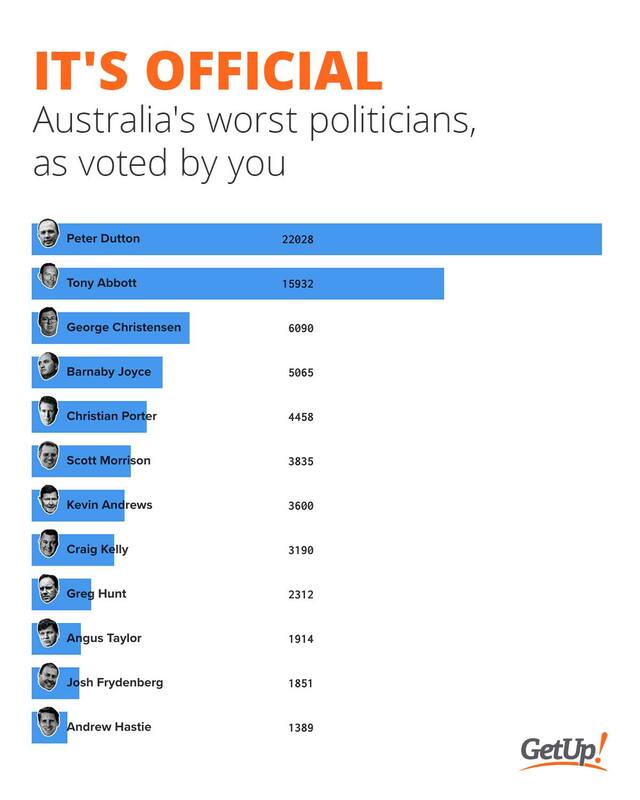 When the votes were tallied last week, it was Dutton who took out first place, with over 22,000 votes. Next in line was backbench bully ex-PM Tony Abbott with almost 16,000. And bringing up the rear was Liberal Nationals backbencher George Christensen with a little over 6,000 votes. GetUp is aiming to take out politicians that are standing in the way of progressive policies. Specifically, the MPs “who have championed Adani, trashed renewables, left refugees in limbo, viciously attacked people doing it tough, and defunded our ABC”. And while it sees this new campaign will complement those it already has underway targeting Dutton and Abbott, GetUp is now considering which of the other main offenders on its hitlist it can attempt to topple at the upcoming federal election. 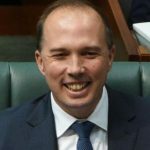 “Seeing Peter Dutton voted as the number one target of a people powered campaign – alongside climate change denier Tony Abbott – is due to his extreme views and heartless voting record, which put him at odds with everyday people,” said GetUp elections director Henny Smith. 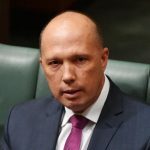 The lobby group got started on the home affairs minister in June last year, when it launched it’s Time to Ditch Dutton campaign, with the aim of persuading voters in the Queensland seat of Dickson that it’s time to give the minister – who’s been representing them since 2001 – the flick. Indeed, Dutton is barely holding onto his marginal seat. The 2016 election saw a 5.2 percent swing against him, which left him with a margin of just 1.6 percent. So, the minister could be swept off his perch in the next election by a mere 1,500 votes. A total of 28,761 Australians took part in the hard right hitlist vote. Family man, Barnaby Joyce came in at fourth place with a little over 5,000 votes, while reigning PM and Sovereign Borders architect Scott Morrison ran a steady race coming in at sixth position with just under 4,000 votes. And the elections director made special mention of Australian attorney general Christian Porter, saying his “high vote” on their website “is also telling”. The former social services minister came in at fifth on the hitlist with 4,458 votes. According to Smith, Mr Porter’s unpopularity is “clearly” due to the public not having “forgotten his pursuit of whistleblower Witness K”, or the fact that the attorney general is the man behind the “appalling robo-debt fiasco”. And let’s not forget that it was Porter’s office that directed Coalition senators via two separate emails to vote in favour of a Hanson motion asserting that “It’s OK to be white”. And then he tried to cover it up as an “administrative error”, when being called out on its white supremacist overtones. Meanwhile, back in the seat of Dickson, it seems that Dutton’s slim hold might come to an end in the next election, especially considering the fall out from last year’s Liberal Party leadership spill, and the Labor landslide victory in the November Victorian state election. But, in politics nothing is a given, and that’s why GetUp and other parties have got the home affairs minister firmly in their sights. 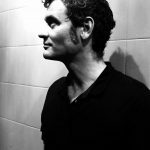 The Australian Greens have pitted Dutton’s polar opposite against him: Oxford-educated human rights lawyer Benedict Coyne. And Coyne’s got some strong support behind him with renowned barrister Julian Burnside QC having hosted a fundraising dinner for him last September at his home in Melbourne’s Hawthorne. In the invitation, Mr Burnside remarked that he “would like to see Dutton miss out on the next election”. 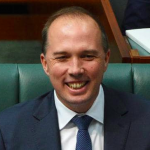 “Dutton is dishonest and a hypocrite,” the human rights barrister said last October. “I think he is arguably the worst federal MP we have had in Australia.” And he pointed to a nasty remark the minister had made in regard to not showing any compassion to asylum seekers in offshore detention. But, the next election is not only about one politician, despite how much the general populace loathes him. And with over half a decade in power under the Coalition’s belt, many in middle Australia who once supported it now realise its hard-line brand of politicking benefits only a few. “Australians know who is to blame for the lack of action on climate change, for slowing the transition to clean energy, for the brutal treatment of asylum seekers, for leaving our poor and vulnerable behind and for defunding the ABC and SBS,” Ms Smith concluded. 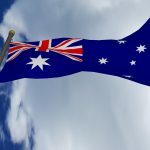 Peter as PM: What Would it Mean for Australia?